Sakar International has formally announced the distinctly Nikon-esque iM1836 - a modular camera system wearing Polaroid branding. 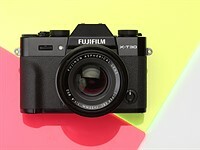 Details are scarce - with the company able to give little information (and some of that being improbable), but the first model is said to be an Android-based, Wi-Fi-connected camera with Ricoh GXR-style interchangeable modules with the sensor built into the lens. Further adapter modules are promised to allow use of Pentax K, Nikon F and Micro Four Thirds lenses. The Android-based iM1836 is due to go on sale during the first quarter of 2013. It will run Android 4.1 (Jelly Bean) and features a 3.5" touch screen on the back of the body to operate it. 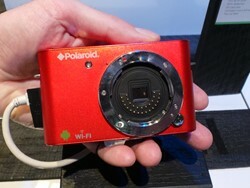 Peer-to-peer Wi-Fi and Bluetooth connectivity will allow the camera to upload its images to other devices. 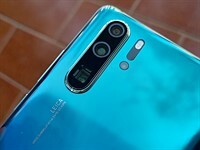 However, as with the Ricoh GXR system, the body doesn't contain a sensor, instead the company says there will be an 18MP 1" sensor in the lens module that mounts on the front. This 10-30mm module (that again looks lawyer-pleasingly similar to Nikon's 1 System kit zoom), will offer a 27-81mm equivalent range. Adapter modules are promised that will allow the use of Micro Four Thirds, Pentax K or Nikon F-mount lenses however, we are told these will also utilize 1" sensors - giving an effective 2.7x crop. We suspect Sakar is mistaken when it refers to the iM1836 as having a 'Compact Micro 4/3 body' on its website. Other, non-Android bodies are on show at CES, including iM1232W that features Wi-Fi and the iM1030 that doesn't, but details of these are even more vague (the styling of which appears to have also taken inspiration from recent mirrorless models). We'll be reporting more over at Connect, but for now we wouldn't be surprised if any or all of this information changed before the cameras arrive on the shop shelves (expected in the first quarter of 2013). The back of the lens is blocked-off. And, despite appearances, there's no sensor in the iM1836's body. The iM1232W and iM1030 look much the same as one another. The 1232 will include Wi-Fi connectivity These models are not Android-based and include conventional camera controls. 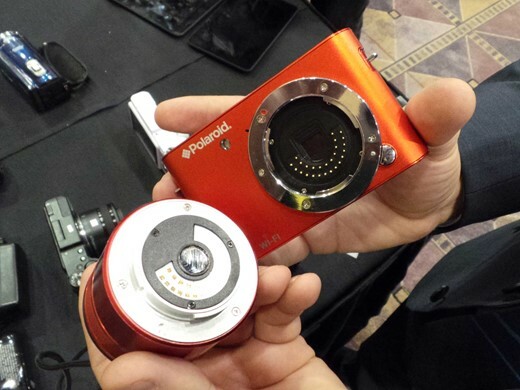 Las Vegas (January 8, 2013) — Polaroid today unveiled the first and only Android-powered compact interchangeable-lens smart camera that makes it easy and fun for anyone to capture outstanding, professional quality images and instantly share them with friends. 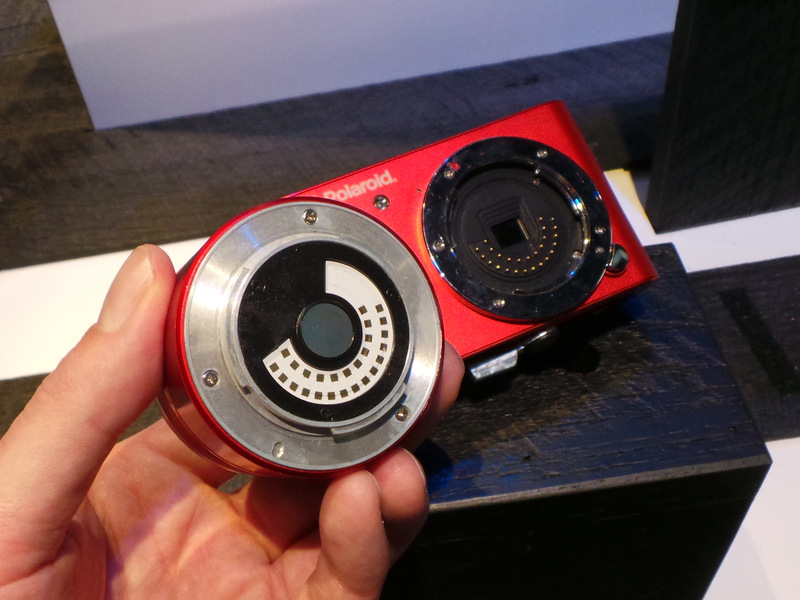 The 18 megapixel Polaroid iM1836 camera debuted at the 2013 International Consumer Electronics show, Jan. 8-11 at the Las Vegas Convention Center and will be on display in the Polaroid Booth #13613 throughout the show. Produced by Sakar International, an authorized Polaroid licensee, the iM1836 camera features the latest Android 4.1 “Jelly Bean” operating system, the smoothest and fastest Android OS yet, and comes standard with a 10-30mm optical zoom lens, and will hit store shelves in the first quarter of 2013 at an MSRP of $399. The Polaroid iM1836 camera will also offer consumers the flexibility to explore their creativity with interchangeable lenses, since all existing Micro Four Thirds system lenses will work with the iM1836 with an adapter. 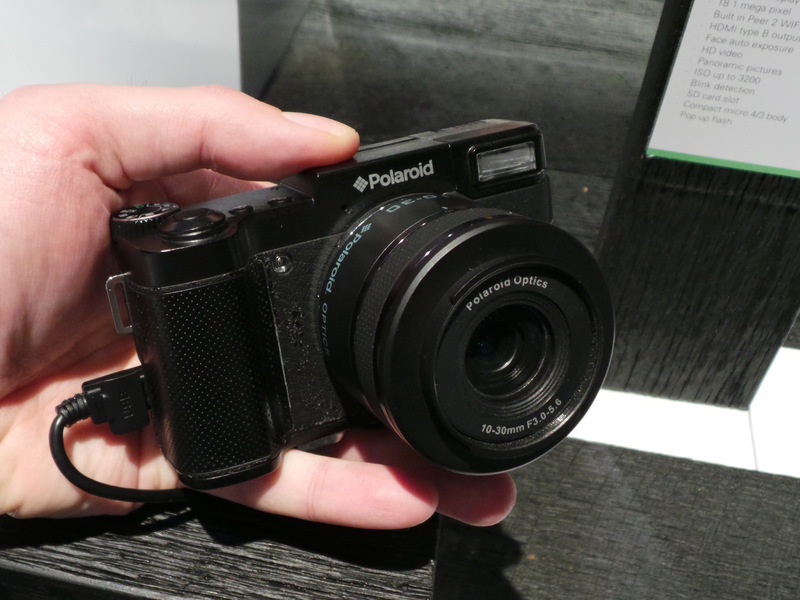 The Polaroid iM1836 camera is the first of its kind to pair interchangeable lens options, like those typically only found on more expensive D-SLR cameras, with the ultra-intuitive and familiar Android OS. This powerful combination allows consumers of any skill level to get professional-quality results without the cost and complexity of a professional system. The lightweight device is portable and compact, perfect for dropping it into a backpack or purse, ready to capture outstanding images wherever and whenever they happen. With the vibrant 3.5” capacitive touchscreen LCD display and the fast and fluid Android interface/menu, anyone can simply point and shoot great photos in a snap—no more fiddling with the camera and missing the shot. Auto blink detection, auto face exposure and pop-up flash ensure a great shot every time. The Polaroid iM1836 even captures wide-angle panoramic shots for impressive landscape photography without the added cost and weight of high-end equipment. And, when the action calls for more than just a still image, the iM1836 camera also captures 1080p HD video. Plus, the built-in HDMI output turns this compact device into a multimedia player—just connect it to any TV or monitor to view video or photo slide shows. Combining the flexibility and creativity of an interchangeable lens camera with the power of the Android 4.1 platform, the Polaroid iM1836 camera makes it easy for photographers of any skill level to point, shoot, share and tag great photos instantly and effortlessly. With built-in peer-to-peer Wi-Fi and easy-to-use Polaroid photo sharing apps on board, the Polaroid iM1836 camera lets users instantly upload and share stunning, professional-quality image creations with friends via Facebook, Twitter, YouTube, Flikr, Vimeo and more, all at the touch of a button. 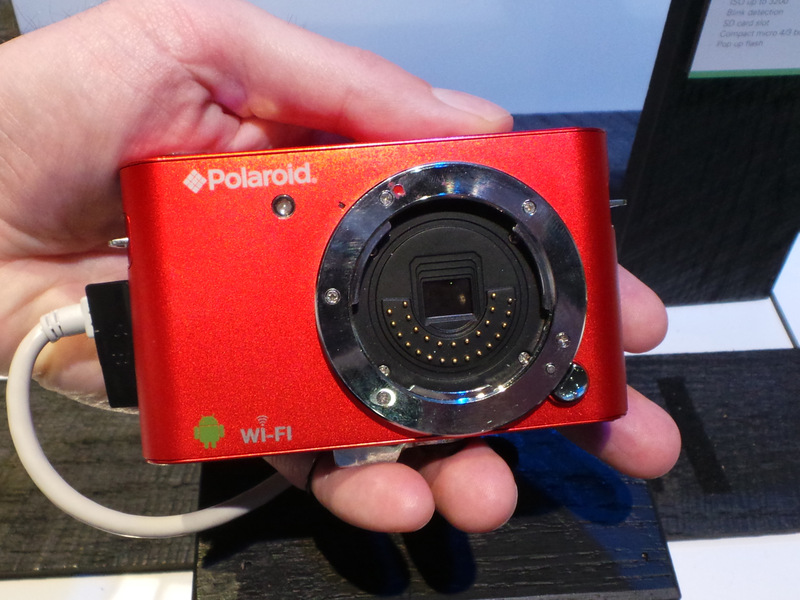 When Wi-Fi isn’t available, built-in Bluetooth connectivity pairs the Polaroid iM1836 camera with any Bluetooth-enabled device to upload images and video through a mobile phone, PC or even iPod Touch. To check out the latest-generation digital imaging Polaroid products, visit Booth #13613 during the 2013 CES or visit www.polaroid.com. Picked up my own polaroid after checking out a few reviews of cheaper ones on Amazon ( http://lastdaysofpolaroid.com) Not sure if I want to make the switch to expensive-r models. A camera with 2013 components, and an 1836 performance. That's what the model name seems to mean to me! 3.8 sec startup time? Is it a diesel engine? 0.5 sec shutter lag? 10 bit ADC? 1 frame/sec? .... 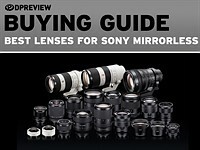 These are specs listed by Adorama. Is it lack of engineering capability or a budget squeezed by clueless bean counters? Do these people actually have a REAL marketing department that knows what is happening in the camera world? There "WAS" a lot of potential for this camera if they put some teeth in it, and if they didn't design it as a copy of one of the most recognizable cameras of its class on the market. Let an intern student do the styling for crying out loud! Again, what a shame! A penny-wise, and a dollar-fool. Now with such specs, why would Nikon bother to sue them? They should have left them sell it (if they could) and enjoy the jokes about it! If you can make a lens +sensor module, why not make lens module and a sensor module? Is that too difficult? If the sensor is in the lens and given that th lens controls could be incorporated right into the lens, why design such a retro ugly body? They could have broken all design paradigms. I hope for Polaroid's sake that I'm wrong, but I fear that this product is doomed to failure. Further to my previous post, I can now see there is no rear element or sensor. Which begs the question what's the purpose of sensor like cavity and the circular silver plate at the rear of the lens/sensor? The lens/sensor module has potential if it's implemented correctly. For example if the module was designed to be used with other devices. Like phones, tablets and even MP3 players, then it would have created a fairly unique niche. Unfortunately they've seen fit to use a rather large bayonet mount, so it's unlikely that anyone else will adopt it for other devices. For a camera the modular system only makes sense if you're trying to make a truely compact system, and neither body appears particular small or slim. Hopefully Sakar/Polaroid will prove all the doubters wrong and produce a cracking budget system. In reality I fear it could end up as vapourware, and at best short lived. 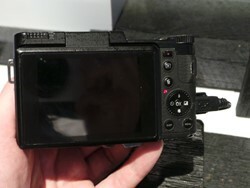 Th idea of a lenser modules (a lens with built-in sensor) is not new (Ricoh GXR), but Polaroid (Sakar) presented a nice follow-up example of a modular camera. 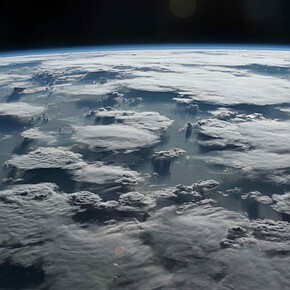 The tuning and fitting together a lens and a sensor (including the sensor micro-lenses) is potentially a best way to create the ultimate image quality and to suppress the environmental effects (such as dust). 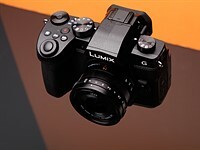 I hope that the final version Polaroid camera(s) would be well-made, and I'm looking forward to try it with the Micro Four Thirds lens adapter. Anyone entering into photography for the first time aspiring to anything better than a compact or smartphone will be really confused by this product if they haven't already been by the variety of mirrorless options already on offer. 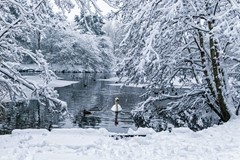 But, on the other hand, exciting for those who can see that these options can expand their photographic creativity. Sensor in lens is no problem if sensor + lens = regular cost of lens alone. Polaroid made an art form out of selling cheap tacky bodies to further on-sell their very expensive patented instant print film. One might wonder how they will manage here. Well I think the idea of attaching a sensor to a lens is a bit limiting. But the idea of interchangeable adapters that each has its own sensor and can accept M4/3rds, Nex and other lenses is brilliant. That way the sensor or body can independently be upgraded plus a wide range of lenses can be supported... assuming they make enough full functioned adapters. And various body designs could make use of these adapters. I don't know what they will do about shutters... wouldn't this require a global electronic shutter in the sensor since I don't see how they'll fit one in a lens adapter. How this will play out in reality on this product is unknown. how bulky will be the camera+adapter+lens? 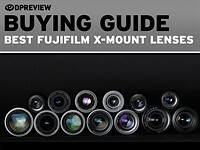 i thought the Ricoh GXR system started with sensor+lens modules...? the telephoo lens had a smaller sensor for greater 'crop reach' and the.. other, not tele, lens had a larger sensor. i agree that putting a sensor with each lens is odd. I guess the GXR doesn't work that way, now. I thought the Polaroid thing might be interesting for the cost if it had adapters for the lenses i like. i don't want a built-in sensor, though. You will always get extra lens size because of the longer flange back distance necessary in slr design cameras, this also usually means a wider throat diameter and therefore a physically much larger lens. But the body will be compact and even host body + adapter + ex-slr lens is always smaller than a dslr package. Ricoh invented the modular package on rails. Works well but it is too avant garde for most. Imitation is the sincerest form of flattery. Polaroid and Ricoh have noticed that sensors are no longer turning cartwheels in advancement any more and lenses get cheaper to make every year. The GXR still works that way, because it was designed that way. So far, Ricoh has made five lensor modules: a 28-300 mm with a 1/2.3" sensor, a 24-72 mm with a 1/1.7" sensor, and three modules with APS-C sensors (24-85 mm, 28 mm F2.5, 50 mm F2.5 Macro). There is also an APS-C lens mount module for M mount lenses. Huh... seems way too early for an April Fool's joke. So, Polaroid made quite a few bucks over the years selling April Fool's Joke cameras that used their proprietary film. The joke was on those who bought them by the squillions to get instant prints. @Tom - this is not Polaroid. This is some Asian company that has bought the brand name. Sakar International, Inc. is a leading provider of consumer electronics and accessories. With a rich heritage of technology innovation since 1977, Sakar has developed a global presence by consistently evolving alongside technology to develop on-trend, cutting edge products. Sakar licenses over forty major entertainment brands and has maintained a diverse portfolio of product offerings, including: digital cameras, video recorders, karaoke machines and small appliances, along with audio, tablet, camera, smartphone and computer accessories. Sakar acquired the Vivitar brand in 2008 and has since launched a full line of photographic, optic and related accessories. Sakar is headquartered in Edison, New Jersey. But what other option did people have for taking naked pictures of their girlfriends except for Polaroid cameras and their instant prints? The rectangular aperture looks too small for a 1" sensor. Looks more like a 1/1.7" sensor would fit there. 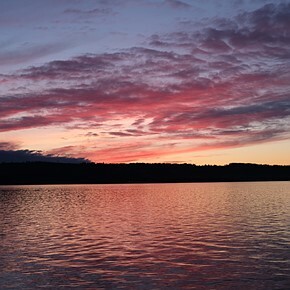 Compare to Nikon 1 camera. The inner circle of contacts would be in the way. Why so many contacts for the lens anyway? This almost seems to be some kind of joke. Read the story - Sakar is saying there is no sensor in the body. What would be a sensor recess in any other camera is just a piece of plastic. I understand that there is no sensor that is why I said "the aperture" and "sensor would fit there". Now look at the inner contact rings. No way will a 1" sensor fit. In the plastic mock up, there is only room for a 1/1.7 sized sensor (or less). Look at a Nikon 1 body. The sensor and recess are much larger. If you tried to set a Nikon 1 senor in that mock-up, it would touch the pins of the inner circle at the corners (or nearly so). Just no room for it and that seems odd to me. Those contacts and the hole back there are irrelevant to the sensor size. The sensor is forward of that, entirely inside the lens. Unless Sakar has somehow managed to make bug, cheap sensors this makes no sense, just like Ricoh's poorly conceived system. Having a removable sensor/mount module is mildly interesting to people who can't make up their minds, but from this prototype the whole business mistly hangs off the front of the body, and that's just silly. A module that mounted back into a deeprecess in the body with contacts on the side would be much more logical. Odd how this is being called Nikonesque. When the J1 was introduced people jumped all over it as a Leica ripoff. This must be, too, though I'm sure they had Nikon in mind. That other camera looks impossibly crude, like a plastic model of a camera glued together with model cement by a ten-year-old. Not a very careful one, either. Sakar International, Inc. is a leading provider of consumer electronics and accessories. With a rich heritage of technology innovation since 1977, Sakar has developed a global presence by consistently evolving alongside technology to develop on-trend, cutting-edge products. Sakar licenses more than 40 major entertainment and corporate brands and has maintained a diverse portfolio of product offerings, including: tablets, digital cameras, karaoke machines, small appliances, and accessories for audio devices, tablets, cameras, smart phones and computers. Sakar is headquartered in Edison, New Jersey, with additional offices in the United Kingdom, Canada, Latin America, Hong Kong and China. >>> In an other word...this company does not really know what it wants to do. They are lusting for the kind of electronics + Trend marriage product thing...in any field it seems. A fleet of cameras to be sold in bubble packages in Walmart, etc. Not really aimed at DPReview readers, except maybe as gifts to their young children. Toy cameras like the Polaroid "instant film" was a toy used by millions. There are toy cameras about that are really toys - here we have an entry level toy with a cute swappable camera unit that is no more intimidating than your mobile phone. Make them cheap enough and they will sell. Holgas have made a comeback as well. 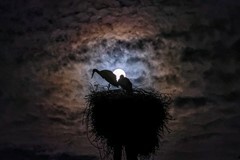 We get confused thinking that the majority want great images. In reality if a mobile phone can do it then this is a proper camera to them, make it cheap is all that is asked, the click-in lens unit will astound your friends and soon enough many great "mobile phone images" will emerge. No functional prototype yet, confusing specs and they are supposed to be shipping finished products this quarter? Would I then be able to connect something other than a lens to the camera for capturing data which may or may not be visual? A camera with a functionality as a GXR, lens and sensor mated together, user interface elements in the body, can be a feasible idea. It has some advantages and some drawbacks. I feel sorry for the Polaroid brand name. Sensor in lens? Throw away lens when sensor is outdated? Why need body at all?? Does it have printer? Sakar? Who is Sakar, some evil toy electronics conglomorate? Built in Peer 2 Peer WIFI (iM1232W) iM what? Yeah. Epic fail! It's just to say "For what is this?" Those evil, big bad corporations. They are probably kicking puppies and stealing candy from babies too. They must be stopped at all costs! That iM business is a model number. Which makes it sound like their will be more than on of these, but only one with WiFi. That makes no sense at all for an Android based camera. Who would want one without WiFi? Maybe a Mongolian shepherd. It's looks like it was designed be one. 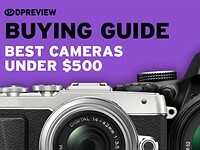 "that again looks lawyer-pleasingly similar to Nikon's 1 System kit zoom"
Dpreview: Your historical reviews are a great resource, but your crown has slipped, no longer first with the news or reviews, no longer -in my opinion- the go to site. Sloppy prose that doesn't actually mean anything is just the start of it, I could mention the pith-poor video section, but you seem to have had the decency to put that out it's misery. C'mon guys, get some decent writing back in and, and some scoops. And maybe even some fresher reviews (D4? EOS M?) rehashed press releases are not enough, you used to cater to the discerning reader. 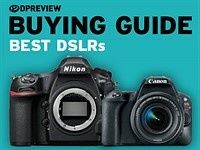 "lawyer-pleasingly" means DPREVIEW is under the belief that this company does not have rights to the Nikon 1's technology and as such lawyers are salivating at the likely Nikon issued lawsuit forthcoming. They are not just talking about the specs. They look like Nikon 1 lenses. Sort of. This makes me so glad I bought a V1. Nikon's lawyers might stop Sakar's magic duplication crew before they get around to copying it. I guess they're more likely to copy the V2, unless its ugliness breaks their duplicator. This just gets weirder and weirder, It looks just like it's supposed to have a small Pentax Q style sensor, but now we learn that's just a dummy (and a dummy rear lens element?) 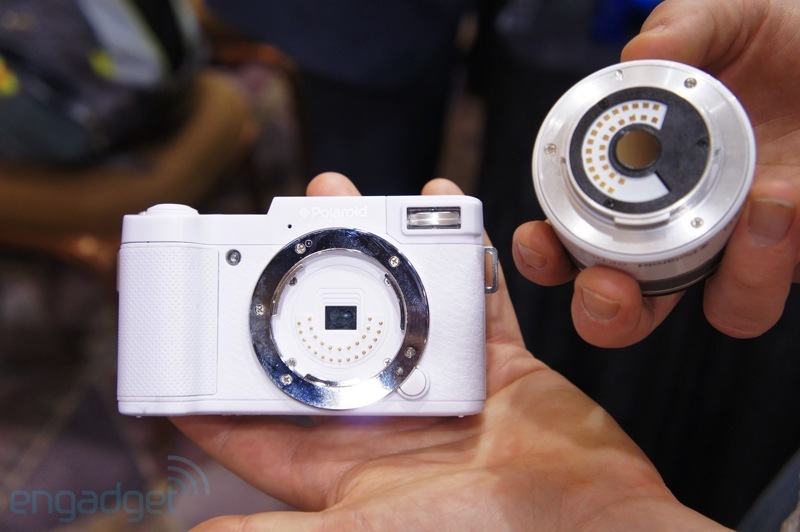 and it's actually a GXR style lens and sensor module? But in a bayonet fitting? It's like they changed their mind half way through development. 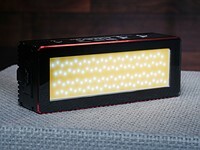 I would love to see real modular camera just like GXR. Basicly you would have Body without sensor. Then you would have sensor blocks ie. m43, NEX, EOS-M etc. And last the lenses. 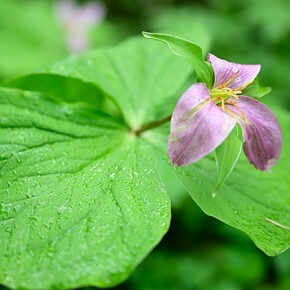 It (lens/sensor combining) didn't really work for Ricoh with the GXR and they put a lot of effort into it. Maybe 'Polaroid' has too, but this seems a bit half-baked and the manufacturer doesn't appear to to know its own camera. We shall see. The advantage of removable lens systems is that you can upgrade the body ( i.e. the sensor et al ) while keeping your good selection of valuable glass. This idea of the sensor being part of the lens completely wipes that out. If you want a better sensor you effectively have to buy a sensor as well. And if you decide to change systems the value of your equipment is much lower, because the lens+sensor has intrinsically less appeal to future buyers than the lens and sensor as separate parts. 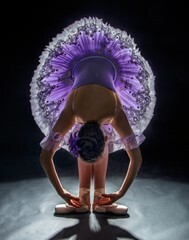 Sensor in the lens...uhmmm...., in practice, we have multiple sensors for the same body, what is the advantage? The price will certainly not be. I Think. You can use any lens with their android powered body! That's pretty awesome ... on paper. They already say they plan a MFT adapter with 1" sensor, but if they want to, they can put in a MFT sensor in the adapter that attaches to the body. Then if you want to mount a NEX lens, put on an NEX adapter with an apsc sensor inside. Where's the instant photos? Looks like they've left out the only feature that's truly 'Polaroid', guess I'll have to keep printing my Instagram pictures on Post-It notes instead. The pictures appear to show a sensor in the body as well as rear element on the lens. Neither in keeping with the alleged spec. On the subject of the spec, the lens/sensor module make even less sense. I don't see any advantage over a more conventional layout. Surely this will just make lenses needlessly expensive compared to other compact systems. I see a body with a sensor and a lens detached. I've never seen the nikon cx mount but that sure looks like a rebadged nikon v1. There is a whole lot that doesn't add up with this preview and what has been leaked already. 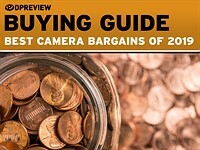 Everything previously said it was an interchangeable lens camera and nothing else. Some clarification would be nice. Yes, it would, but what little the company is saying doesn't make much (conventional) sense. It's not a CX-mount camera - that much is certain. It's because picture is taken from bad angle. If you look at Engadget's hands-on gallery from yesterday you will clearly see that there is no rear glass in lens, it's metal (or shiny plastic). No sensor in body either. All this is also stated on Polaroid web site (no link to the site in this article for some reasons). So, everything is consistent. Nothing prevents you from seeing Nikon 1 mount. Photos are in DPR reviews and it looks differently. It doesn't have two rows of contacts and sensor is larger than what appears on this picture. BTW, other previews are saying that the camera is far from being ready for prime time. Also, the 'lensor' release button is in a different location, likely the mechanical catch in the mount for that release is as well. Clarity is not Sakar's strong point. Kind of sad for a camera maker. About all that's clear is that this is nothing like a Nikon 1 except in styling. That doesn't seem right. If the sensor is built into the lens, why does the lens have a rear element at all? Does autofocus work with the adaptors? That's what would make or break it for me. I suspect it doesn't, as the AF is proprietary. There have been plenty of third-party AF lenses for SLR mounts. For the in-body-motor screwdriven Pentax and Nikon lenses there's not even much of a protocol needed for AF, but the adapter would actually need a motor. But first we need to see what the reality will be. Sakar probably hired the GXR development team. It's doubtful Ricoh kept them on. Wow, didn't see that coming. No sensor in the body?! The Minolta Dimage EX (also sold as EX 1500) is a digital camera, first marketed in 1998. The Ricoh GXR is a compact digital camera first announced by Ricoh Company, Ltd, Tokyo on November 10, 2009.